In my next few posts I will be writing about a few of the military themed framing projects that we have worked on lately. Having our shop located in Stittsville, in the west end of Ottawa, we are privileged to have many military personnel as clients. These first two were done for a proud veteran of WWII. 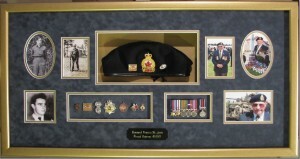 His daughter had his beret, medals and photographs from then and from more recent years. He was unfortunately ailing in hospital so we all wanted to get this shadowbox done quickly for him. We ordered up a plate from our favourite engraving place, Mementos, so that we could include his name along with his items. We placed the three black and white photographs of him from his time in the war in individual windows on the left, and mirrored them on the right with the more recent coloured photographs of him. His medals and pins were mounted onto a blue suede matting and his beret was recessed deep into the shadowbox on gold matting to highlight it. Another frame was stacked under the first to give us the depth we needed to accommodate its depth. When his daughter showed it to him, he sent her back with his #45 General Transport Company panoramic photograph for us to frame to match…. ….I guess he liked it !